44 LOUISVILLE BARS & RESTAURANTS THAT EXCEL IN BOURBON. BOURBON FLIGHTS, BOURBON COCKTAILS, BOURBON-INFUSED FOOD AND GREAT BOURBON CONVERSATIONS. 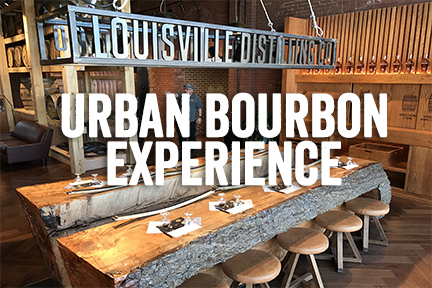 After a day of exploring Louisville & Kentucky’s greatest distilleries, it’s time to put your new knowledge to the test on the Urban Bourbon Trail®. This collection of bars and restaurants have a significant knowledge of Bourbon and are eager to share their favorite beverage with you. 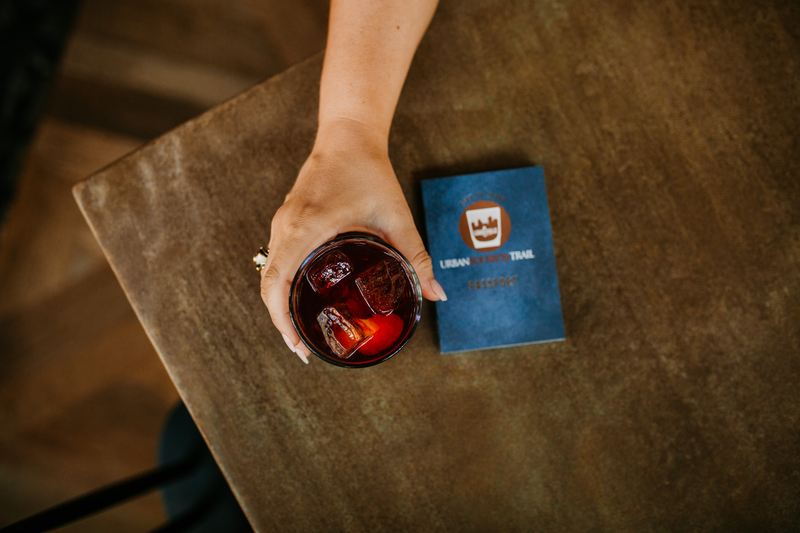 To start, pick up an Urban Bourbon Trail® Passport at our Louisville Visitor Center (4th & Jefferson Streets Downtown) or at any one of the 44 participating bars & restaurants. You can find all participating establishments below! Your goal? Get six stamps! (Note: Any purchase at these establishments will earn you a stamp – you don’t have to be a Bourbon drinker!) As soon as you collect six, redeem your passport at the Louisville Visitor Center – or send it by mail – and receive the annual edition of the Urban Bourbon Trailblazer T-Shirt. Is the Urban Bourbon Trail a collection of distilleries? No, the Urban Bourbon Trail was created back in 2008 before Louisville had any distillery experiences! It is a collection of bars and restaurants with a significant Bourbon culture. 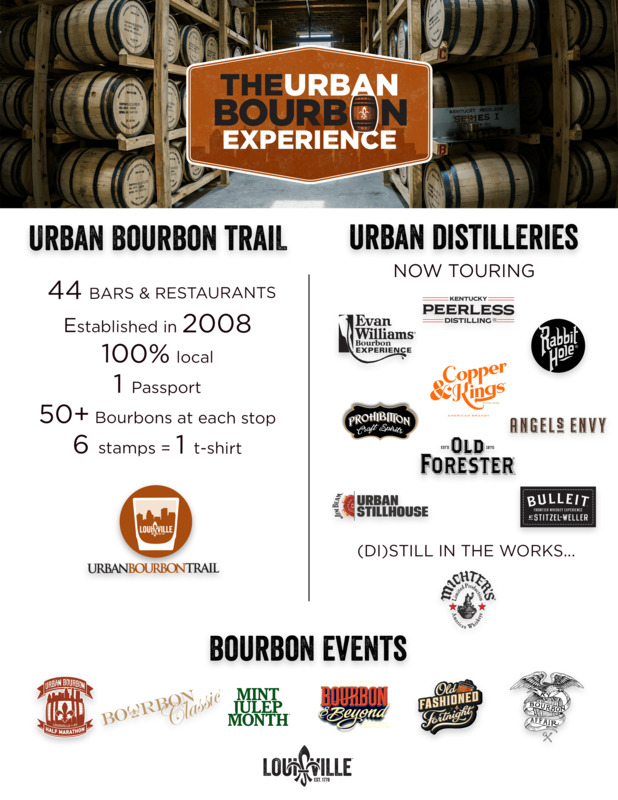 What’s the difference between the Urban Bourbon Trail and the Urban Bourbon Experience? We thought you might ask that! We made a little infographic to help explain. Basically, the Trail = bars & restaurants. The Experience = bars, restaurants, distilleries (open now!) & events. Can my establishment join the Urban Bourbon Trail? Maybe! Are you a bar or restaurant? Do you have a significant Bourbon culture, with more than 50 Bourbons? If so, feel free to review the current criteria (subject to change by the next go-around). Enrollment is only open from March to May each year and the annual UBT passport is released September 1. Contact us here. Are you the Kentucky Bourbon Trail? Nope! But some of Louisville’s distilleries are part of it. The Kentucky Bourbon Trail covers all of Kentucky and is managed by the Kentucky Distiller’s Association. They work with distillery partners to create a state-wise Bourbon visitor experience! More info here: Kentucky Bourbon Trail. After a day in Bourbon Country visiting the distilleries or an afternoon enjoying Louisville’s new Urban Bourbon Experience, it’s time to test your newfound knowledge on the Urban Bourbon Trail. Louisville has been home to many distillers since Evan Williams marketed his first whiskey in the city in 1780. Until the 1920’s, a portion of Main Street was known as “Whiskey Row” when as many as 50 distilleries were active. As the distillery experiences continue to grow in Louisville, you can celebrate the city’s bourbon heritage at some of the world’s best bourbon bars. Morning, noon or night, bourbon can be found in its natural environment…the Louisville bars and restaurants serving up America’s only native spirit in drinks and innovative dishes from mint julep pancakes to bourbon barrel smoked salmon or a bourbon ball milkshake. All of the stops will have their own version of Louisville’s two signature drinks. The Old Fashioned, created here in the 1880’s at the Pendennis Club, is Louisville’s Official Cocktail. And of course, the Mint Julep has been the official drink of the Kentucky Derby since 1938. The establishments on the Urban Bourbon Trail vary from historic hotel properties that once served Kentucky Whiskey to the likes of Al Capone and F. Scott Fitzgerald to cosmopolitan “scenes” where urban trend-setters are making retro drinks such as the Old-Fashioned and Manhattan in vogue again. Six are in downtown hotels, several have been internationally recognized as the “world’s top whiskey bars” and most also feature bourbon-inspired dining. All offer bourbon flights, special bourbon cocktails and have at least 50 different bourbon labels on the bar with trained staff that can explain the nuances and tasting notes in the varied offerings from Jim Beam Black to Elmer T. Lee. The “Urban Bourbon Trail” mark is being used with the permission of the Kentucky Distillers’ Association. The Kentucky Distillers’ Association, its member distilleries and the Louisville Convention and Visitors Bureau ask that you please enjoy Kentucky Bourbon responsibly. You must be 21 to participate in the Urban Bourbon Trail passport program. Brendon’s Catch 23 is a Chef-Driven Restaurant featuring Seafood, with Steak, Low Country and Hand Held Options in Downtown Louisville.